January 25, 2019 - This morning we are seeing ground stops all over the east coast because air traffic controllers can no longer safely run the system. It is urgent that we alert our members' and ensure everyone understands this is the outcome we have been warning would happen. "This is exactly what AFA and other aviation unions have been warning would happen. The aviation system depends on the safety professionals who make it run. They have been doing unbelievably heroic work even as they are betrayed by the government that employs them. They are fatigued, worried, and distracted - but they won't risk our safety. So the planes will stay on the ground. This is anything but a sick out - it only about our safety and the air traffic controllers' absolute commitment to it. "Do we have your attention, Congress? Open the government and then get back to the business of democracy to discuss whatever issue you so choose. This shutdown must end immediately. Our country's entire economy is on the line." It is day 35 of the Lockout of over one million Americans. 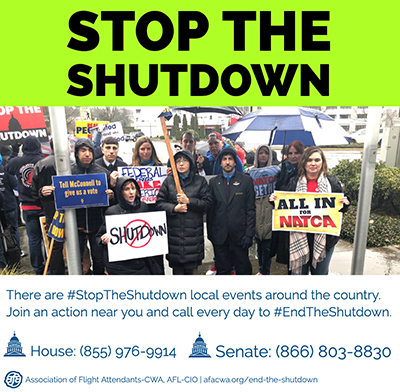 #StopThisShutdown. Call Now!